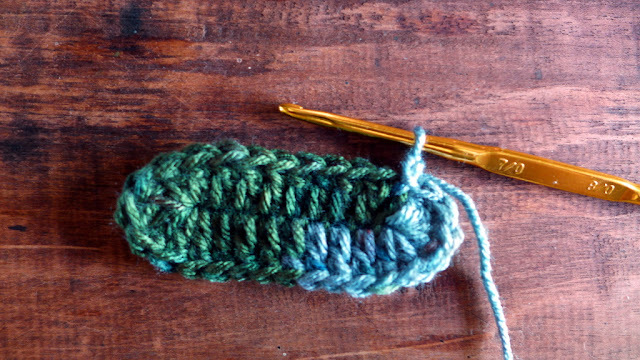 Some time ago, I crocheted a sock, in search of the simplest construction method possible with crochet. I figured out one way which starts at the toe and proceeds upwards. Here is a documentation of the process of crocheting a sock which I hope will help you to understand shaping for the feet and in as a consequence, be motivated to experiment and develop other sock designs as well as crochet new related items such as crochet slippers, crochet shoes, fishnet stockings and ankle socks. Happy crocheting! Design Notes: My socks are for feet 9.5” long and about 4” wide. 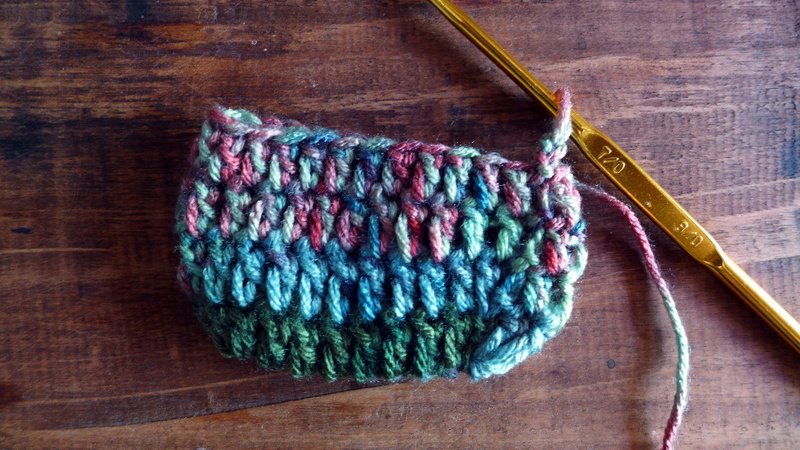 I used Yarn: Antipilling Acrylic by Ice Yarns (3:Light/4-ply) and Hook: 4mm. For a pair of calf-length socks I used 80 grams (or 200 meters) of yarn. I started with a foundation of 9 +2 ch. This foundation chain is about 2” long and is not meant to be the same width as the toes of your feet. 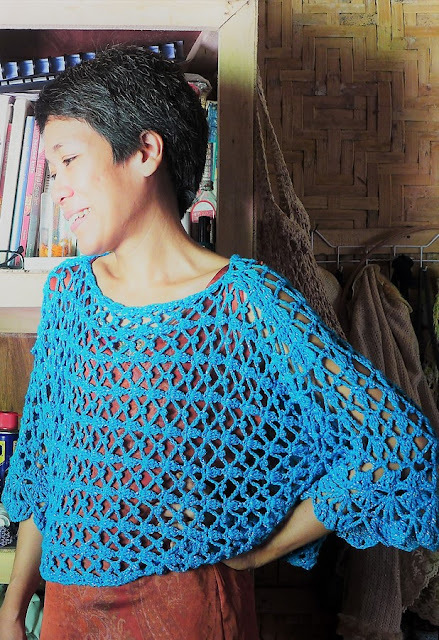 If you use smaller or bigger hook and yarn, the foundation chain may need to be of different length. The basic formula for me is a foundation chain that is about the same width as the three middle toes of your feet. Next, dc in fourth ch fr hook; dc in each of next 6 ch; 7 dc in last ch (this allows you to turn to the opposite side of the foundation ch; dc in each of next 7 ch; in next ch make 6 dc; sl st in first ch to join into a round. This completes the first round of the sock. Ch 2 (this does not count as dc), dc in same ch where sl st was made in first round; dc in each dc all around, ending with sl st in top of 2-ch to join; (28 dc made); Ch 2 and continue in the same manner as described. I made 16 rounds to fit the length from the toes to the point where the leg joins the foot. 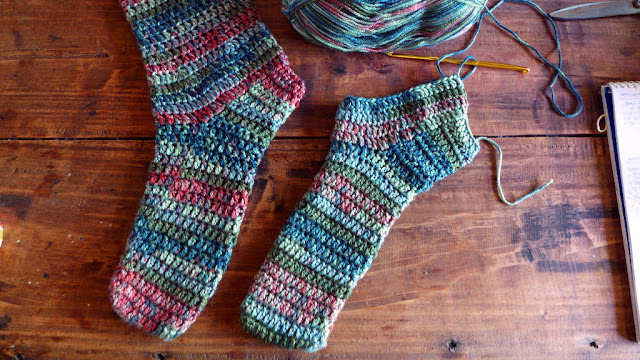 Remember to crochet tightly and to make the length of the sock a bit shorter than your foot since the yarn will stretch. 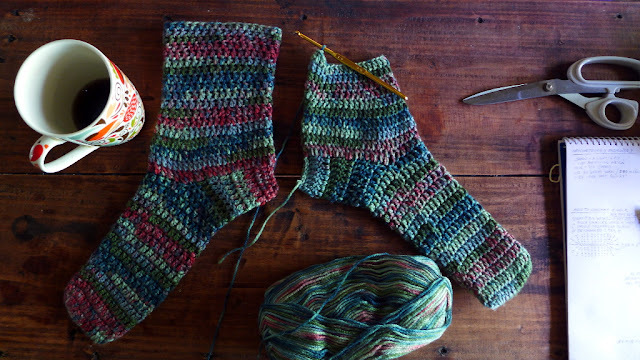 To shape the heel of the sock you will be working in rows instead of rounds. First you need to determine how wide this row is going to be. You can determine this by putting the sock on and measuring over the top of the foot how many stitches from one side of the heel to the next side. The photo below shows half of this length (in thick white line). On my foot, this length measures about 12 stitches. So I subtract that from the total number of stitches around the sock (which is 28 stitches) and I get 16 stitches. 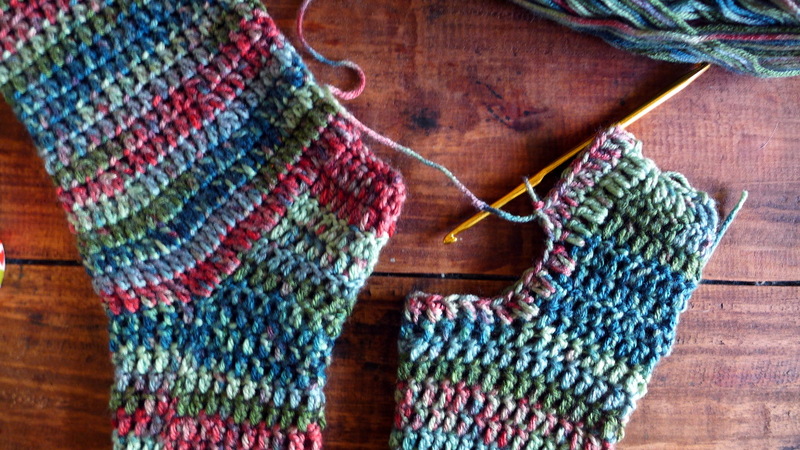 This means, the heel should be made in rows of 16 stitches. So, without fastening off, you just continue on to make the heel as follows: ch 2, dc in first dc, dc in each of next 15 dc (16 dc made); ch 2, turn, dc in first dc, dc in each of the next 15 dc, etc. The next question is, how many rows should the heel be? Here you just need to measure the length of your heel bearing in mind to crochet a bit shorter since the yarn will stretch when worn. In my case, the heel is 7 rows in length. So I made 7 rows of dc for the heel and, as shown in the photos below, at the last row, fold the heel in half and sl st join along the last row. This joins the seam at the back of the heel. Fasten off. So at this point, you should have something that looks like a slipper. The next (and last) thing you need to do now is join the yarn to a dc at the back of the heel and work the leg of the sock in rounds. This is worked in rounds in a manner as earlier established, starting the round with ch 2. There are two questions I encountered here: first, how long should the sock be and second, should I shape the leg of the sock? The first question answered: I decided to make mid-calf length socks, that’s some 18 rounds of dc, or about 7.5” length. 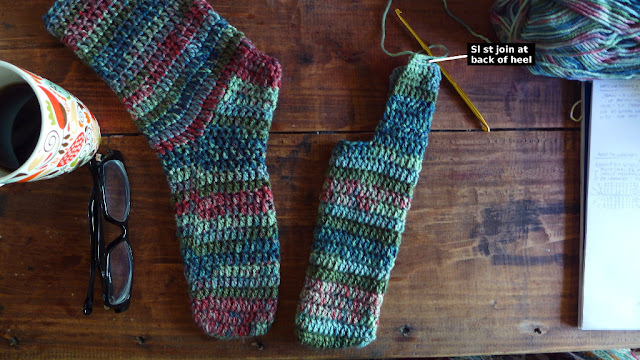 The second question answered: I decided to shape the leg of the sock where my leg narrows the most at the heel, this is at round 4 of the leg of the sock. You may wish to start decreasing at the first round. Decreasing means decreasing the number of stitches with dc2tog evenly all around over 3 rounds, ending the last dec round with 36 dc. Then continuing the rounds with this number of stitches. This means, from the heel I had 48 stitches around the leg and then reduced that to 36 stitches around the leg. I decided to do this so that the sock tapers and tightens at the calf and won’t fall down or slide off. Here are photos showing the leg of the sock in progress. 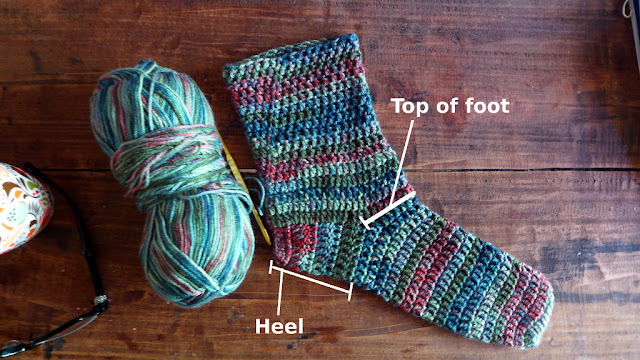 And there you have it – how to crochet a sock. 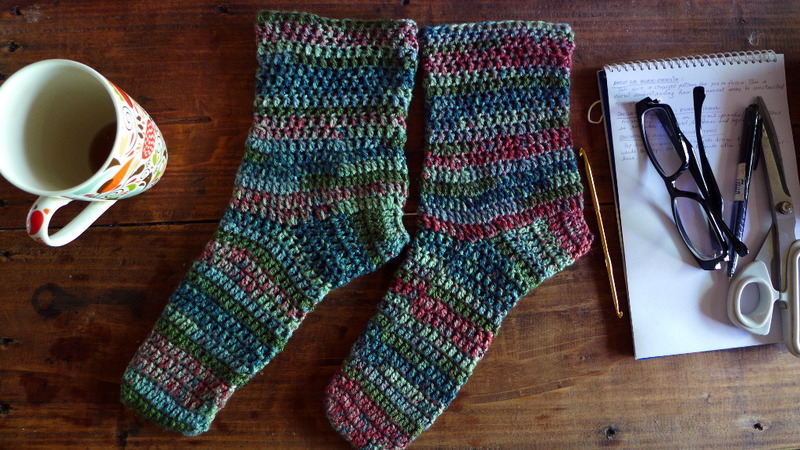 You can adjust the number of stitches and rows and rounds presented here to make a sock in your desired size. 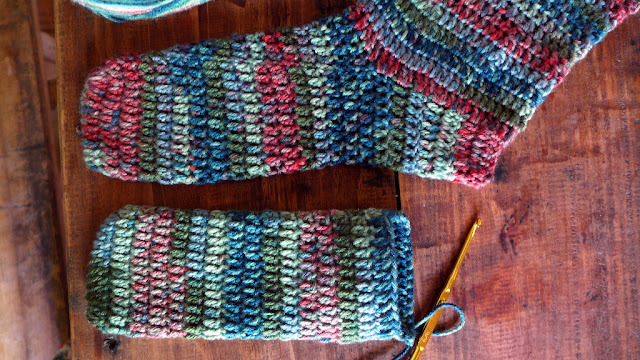 Once you know how to crochet a pair of socks, you can explore the basic pattern with different stitches and shapes, perhaps to make a pair of lacey stockings, a Christmas sock to decorate the Christmas tree, a pair of bedroom slippers, etc.